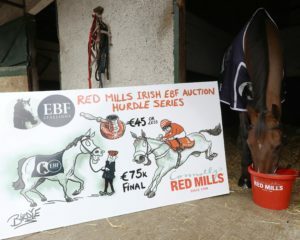 Irish European Breeders’ Fund today announced Connolly’s RED MILLS as co-sponsor of the Irish EBF National Hunt Auction Hurdle Series that will run from September 2018 until April 2019. The series gets underway at Listowel on September 11th with a €20,000 maiden and finishes in April 2019 with a valuable €75,000 final, and total prize-money of €355,000. Gareth Connolly, Sales and Marketing Director at Connolly’s RED MILLS said; “This is more than a sponsorship, this is our direct contribution back to the industry that supports us 365 days of the year. 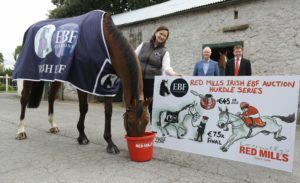 We understand the challenges that trainers and owners are facing and felt this was another perfect opportunity to partner with the Irish EBF to deliver another valuable series. We have had remarkable success with Irish EBF and our partner supplement company Foran Equine, seeing huge interest and participation in the Foran Equine Irish EBF Auction Series. The aim is to do the same now on the National Hunt side with RED MILLS.